From now till October 31, 2017, Four Seasons Resort Koh Samui presents The CoCoRum Experience, part of the new Four Seasons Taste of Place global initiative. Taste of Place features a curated collection of culinary experiences, available only through Four Seasons, that invites local dining enthusiasts to step behind the scenes, and take a look at diverse local culinary practices, traditions and experiments. At Four Seasons Resort Koh Samui, the food and beverage team has created comprehensive itineraries that will explore uncharted aspects of the local food culture, building on the personal relationships and intimate connections between Four Seasons and local distillers. The exclusive experiences range from private tours of local distilleries to farm-to-table mixology classes. The customised itineraries immerse guests in progressive dining experiences that unfold in unique settings with remarkable views of the natural landscape. 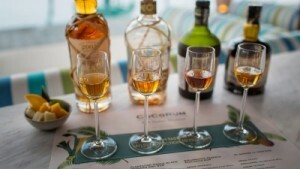 The CoCoRum Experience invites guests to spend an entire day dedicated to learning the art of rum. After learning the basics, guests study the finer points of making rum cocktails in a private mixology class at the Resort’s CoCoRum Restaurant & Bar, which has the largest rum collection in Thailand. Guests also have the opportunity to taste rare artisanal rums from Trinidad and Tobago, Guyana and Barbados, each blended with fresh tropical fruits. This is followed by a private tour of Samui Rum Distillery, the only accredited distillery in Thailand, with transfers by the Resort’s Mercedes Benz S-Class limousine. The exclusive trip is capped with a bottle of CoCoRum’s Signature Aged Rum Negroni to take away, exclusively bottled by Four Seasons Resort Koh Samui. The unique experience extends five hours from 1:00 to 6:00 pm daily. One day advance reservation is recommended and minimum of two persons are required. Priced at THB 12,500 per person. Price is subject to service charge and applicable government tax.